Geekmax: I Wanted to do a Skryim Review... Then I Took an Arrow in the Knee. 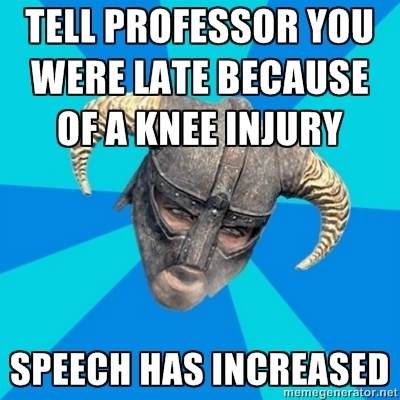 I Wanted to do a Skryim Review... Then I Took an Arrow in the Knee. Well here it is... in all it's unfinished glory, my review of 'The Elder Scrolls V: Skyrim'. Disclaimer: No I am not done playing Skyrim, I have not even come half way to finishing the main quest line, and I haven't picked a side in the civil war. I have however done lots of exploring, completed many side quests, and made it to level 35 so I feel I can give the game a fair shake when reviewing it. First and foremost, I am playing on the PS3... please save your insults, I am fully aware of the problems inherent to the PS3 version of the game. Yes I have experienced lag, thought not all that bad, however two of my closest friends whom also play on the PS3 have experienced horrendous lag and I saw it 1st hand. So let me just get this out of the way.. Bethesda, I am dissapoint. In someways the lag issues with Skyrim on the PS3 are worse than a game breaking bug right at the beginning would be. The lag only starts up once you have put at least 30 hours into the game and you're game save file starts to approach 7mb. This makes you want to start over on another platform, but you have already put so much love into you're first play attempt that you don't want to start over at all. Talk about killing the immersion factor. Lag issues aside, Skyrim is still not perfect, though of course it is damn good. Skyrim is far less buggy than previous Bethesda games (again lag issues aside) which is a step in the right direction. This is not to say it is bug less, just that the bugs are few and far between, and usually not as noticeable when they occur. With an open world with complete freedom to do pretty much what ever you want (NPC's too) Bethesda gets a partial pass for the AI bugs that happen every so often, but when a major feature of the game decides they are just to chicken to come down and fight you (Dragons) that's kind of ridiculous. Thankfully Bethesda has already put out a couple of patches to fix many of these types of issues. Enough about the bad, time for the ENORMOUS amounts of good. Skyrim is definitely the best game Bethesda has ever developed. So much more thought has gone into the game's world and so much more love into it's design. From the craggy/foggy mountains to the dark dank dungeons, everything feels like the level designers made this game their swan song. One of my favorite improvements over 'TES IV: Oblivion' are design layouts of the dungeons. Rather than have to back track through them to exit, almost all of them have a shortcut at the end that takes you near the entrance where you came in. This is very thoughtful especially considering the dungeos are for the most part much longer, deep, and bigger in Skyrim. Random encounters feel much more organic this time around as well, most of the time. There are still the occasional silly NPC's encounters where you feel as if you just bottomed out in the uncanny valley but when it works it works well. One group of NPC's I felt were under utilized were the Giants spread across the tundra. Great looking characters, all of them, but also all look exactly alike, and behave alike, and are just plain forgettable alike. There are a handful of quests that force you to encounter the giants in some way, but they are so common within Skyrim's world you would think they would have a larger role than they do. I want to know more about the giants... maybe some DLC down the line is on it's way, who knows. Combat is vastly improved as well. Lots of attention is given to the dual wielding mechanics in Skyrim, be it double swords, or double spells, or spell/sword ect... but I mostly stick with the tried and true sword and shield combo that more or less forced upon you in Oblivion, and the combat is STILL vastly improved, which says to me as well received as it is it's still under rated. Weapons and opponents have a good sense of weight about them. When you knock the hell out of someone you can tell they felt it, and the same goes for you when the hell gets knocked out of you. I found myself constantly being surprised by the sheer force behind an enemies running power attack with a two handed weapon which I view as a good thing. No more backpedaling to avoid all the big whammies, you'd better brace you self and block well, or be quick enough to move out of the way. Combat is so much more visceral and meaning full almost every melee fight you are forced to stay on your toes. Dragons... to be honest left a little to be desired for me. They look outstanding, but often come across more as a nuisance than a real threat. Unless you get attacked by two of them... or two and a giant... or two giants and two dragons... ect. The 1st couple dragon encounters are exciting and challenging, but once I got into the level 20 ranges I found them to be fairly easy to deal with, then in the 30s they had become almost boring. However again I have not finished the main quest line so maybe things get harder... or thing get shaken up a bit I can't say for sure, but I can say that they are still a very fun addition to the game and are a plus rather than a minus. Last words (for now) Skyrim is a vastly superior game to Oblivion, but it's isn't perfect. It is however probably the best game of 2011, if not just the best bang for your buck. As with any game, it isn't for everyone, but if you want a game that you will spend hundreds of hours in and having fun the entire time, if you want a game that takes you to another world that you can get lost in, this is it.